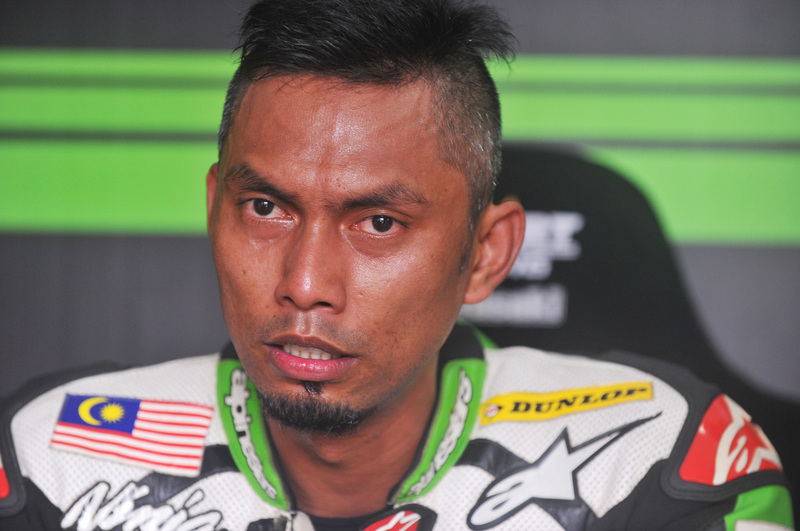 Retirement from the Moto2 World Championship has not ended Azlan Shah Kamaruzaman’s racing career. In 2016, Azlan is set to take on the responsibility as Kawasaki’s lead rider in the SuperSports 600cc category of the FIM Asia Road Racing Championship. For the 32-year-old rider who won the SuperSports 600cc title in 2013, it will be a homecoming. Azlan is well aware that the journey back to the Asian series will not be a walk in the park. “The ARRC gets tougher every year. It continues to attract world-level Asian riders and at the same time, has been able to produce a number of strong contenders through the series itself. I have been away from the series for two years and I am not expecting an easy comeback,” said Azlan. Azlan led the SuperSports 600cc field during Day 1 of the 2016 FIM Asia Road Racing Championship pre-season test currently underway at the Johor Circuit. The returning champion posted 1’32.311s to set the 600cc benchmark. Azlan was 0.444s ahead of Zaqhwan Zaidi’s pace, clocked at 1’32.755s. Zaqhwan’s team mate Yuki Takahashi was third fastest with 1’32.924s. The season opener of the 2016 FIM Asia Road Racing Championship will be held at the Johor Circuit on April 1 and 2, 2016.